Republican Larry Hogan won the race for governor of Maryland Tuesday in a shocking upset over Democratic Lt. Gov. Anthony Brown in a blue state. "This is the largest mandate for change in Maryland in 63 years," Hogan, 58, told his cheering supporters. "Tonight we fell short of our campaign goal," Brown told his supporters as he conceded to Hogan after midnight Wednesday. Hogan said he received a congratulatory call from Republican New Jersey Gov. Chris Christie, who campaigned in Maryland for Hogan. “The governor was so excited that we had the biggest victory, the biggest upset in the entire country, that he wanted to fly his helicopter down here to be with us tonight, but I told him that you guys could not wait another hour,” Hogan told supporters. Some experts suggest that Republican Hogan’s aggressive campaign changed the conversation in a heavily Democratic state – but it’s not exactly smooth sailing ahead for him. "We've got a lot of work to do," Hogan said Wednesday. "Our state economy is in real trouble. We focused on that for years and now we've got to roll up our sleeves and get to work on trying to turn our state around." We talked to three political experts about what Hogan can expect from Maryland, and what Marylanders can expect from Hogan. Hogan’s biggest challenge will be governing as a Republican in an overwhelmingly Democratic state. Granted, those who voted for him were in the mood for a change. But it’s unusual for governors to belong to a political party different from the majority of their constituents – and "these politicians often have little margin for error," said Mark Murray, NBC News senior political editor, pointing to Maryland’s former Republican Gov. Bob Ehrlich, who ran into such problems in 2006 when he lost his re-election bid. Hogan tried to navigate those waters in his campaign, and did a fairly good job of it, said Stella Rouse, an associate professor at the University of Maryland and assistant director of the Center for American Politics and Citizenship (CAPC). 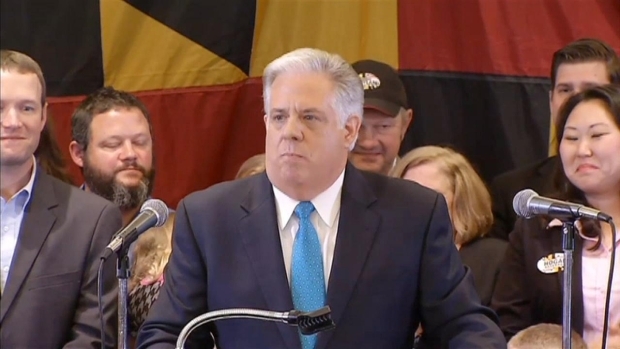 RAW VIDEO: Republican Larry Hogan thanks his supporters for electing him governor of Maryland. "He’s emphasized issues that go beyond just one political party," she said. "…You won’t think in a Democratic-leaning state, that taxes would be an issue, but… he’s done the right things to bring about the issues that are more important to the general electorate." Hogan will have to figure out how to work with Maryland's many Democrats without alienating his conservative base, she said. Murray suggests that voters can expect Hogan to be a little like Chris Christie. "It's not a surprise that we saw New Jersey Gov. Chris Christie campaign so much with Hogan," Murray said. "Like Christie, he'll be a GOP governor in a blue state. That gives him plenty of opportunities like passing bipartisan legislation. But it's also a challenge." RAW VIDEO: Lt. Gov. 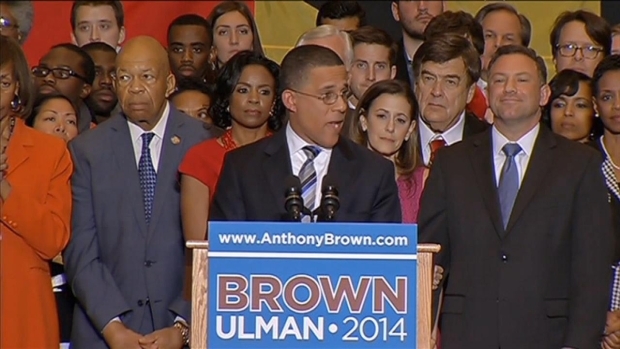 of Maryland Anthony Brown (D) conceded the Maryland gubernatorial race to Larry Hogan (R) around midnight on election night. Rouse, on the other hand, thinks a lot of voters don't know what to expect from Hogan -- but, she said, he's gotten to where he is by being perceived as an outsider and "being a breath of fresh air." "Up to the last 60 to 90 days, he's been a relative unknown in the state...." she said. "I think that has played to his benefit to some extent, but it has also hurt him because I think voters don't know what to expect." While Hogan has been criticized for not having clear plans, Rouse identified taxes and jobs as the two issues he's likely to tackle first. "Those are not, obviously, mutually exclusive," she said. "What it takes to tackle those together will be interesting to see. He has said that the Republican ideal is that cutting taxes will create jobs: How exactly does that happen? … If you cut taxes related to health care, education, there are social services that can turn his tide of popularity pretty quickly." Murray said Hogan should try to pass as much bipartisan legislation as he can. "His road to success is being an independent-leaning governor who can get things done," Murray said. "His challenge is having that R next to his name – Republican." Hogan will also need to follow through on a promise he made, Rouse said: that he won't change or repeal a number of policies O'Malley enacted. "Certainly [he'll have to] follow through with that," she said. "You start dismantling some of those things, that really could be not good at all for having an effective term. But he has a very difficult task because of the support he has on the right.... That's a tough task and that’s a tough task for someone who doesn't have political experience.... Navigating that will affect how successful he is." Hogan's best bet will be to focus on governing over campaigning, said Michael J. Hanmer, an associate professor at UMD and research director for CAPC. "Focus on governing," he said. "Accept that as a Republican governor in a state where the legislative body is controlled by Democrats and party registration is tilted highly in favor of Democrats, to be successful he's going to have to compromise and to figure out a way to do that…." Hanmer admitted that's easier said than done, but said that if Hogan focuses on the job ahead, it will carry him through. "I understand it's tough and there are a lot of pressures to raise money and to be thinking about the next election," he said. "Focus on governing; the other issues will take care of themselves when it comes to the next election."